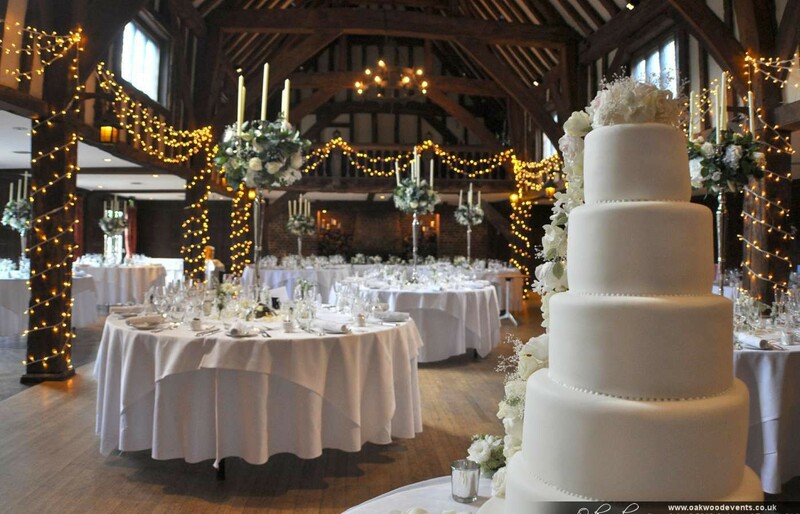 The Tithe Barn at Great Fosters looked gorgeous last Sunday. The flowers and cake were simple, elegant and utterly beautiful. We added a touch of sparkle by winding the pillars with fairy lights and adding a triple swag of lights in between each pillar. I wanted to thank you so much for all the work you put into making our wedding day so special, it was a pleasure working with you. 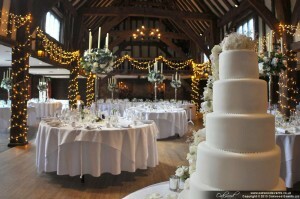 The lighting in the barn at Great Fosters looked amazing and so many guests commented on it. We will certainly recommend you to any of our family and friends that would like lighting at events in the future. Lighting hire for barn weddings in Oxon, Berks & Bucks. Oakwood Events Ltd is a company registered in England with company number 07836313. Copyright © 2011 - 2019 Oakwood Events Ltd.